Welcome to diptyque, the home of perfumers and artists, the heart of their inspiration and creativity. For diptyque, creating fragrances is an art and art is a journey. An imaginary journey of the mind and the senses across olfactory landscapes, far from the paths that others take, in search of rare raw materials and unexpected accords. A journey between the past and the future, between tradition and the avant- garde, toward another place where history, new ideas and disruption combine. diptyque is always in between two worlds, finding its balance between dreams and reality, free from traditional gender codes or cultural boundaries, committed to developing connections and blends that nourish its inspiration. It is a creator of essences and images where the eye, the hand and the nose are united to constantly revisit the surprising world of Haute Parfumerie. We are in Haiti—more specifically the region of Les Cayes in the south. It is December, and the rainy season has barely ended in the Caribbean. We have waited a year for the vetiver roots to reach the optimal length of one meter, at which point they are harvested by hand. Locals refer to this harvesting as “ransacking” the roots from the ground. Bundles of them are then transported to the distillery, where vetiver will again make us wait. It will very slowly distil its essence over 24 hours, the time it takes to extract the golden scented oil. A community-assistance project focused on this essence, which is as precious as gold in Haiti, has been set up with support from Givaudan. * ESR certification: Equitables, Solidaires et Responsables (fair-trade, community-assistance and responsible). According to ESR standards, the fair- trade approach requires buyers to make a long-term commitment to producers in developing countries. The project will help ensure the longevity of the supply chain of this very special vetiver which is so essential to the island of Haiti. Its roots can grow up to three meters long, extending deep down in the loose earth. They help stabilize the island’s volcanic soil, slowing down its erosion. In return, the mineral- rich soil gives this vetiver its aromatic complexity, fiery temperament and delicacy for an irresistibly smoky, sophisticated signature. Here, the roots are never thick and dark with rough, earthy scents, as we find in vetiver grown elsewhere. Haitian vetiver’s roots resemble threads in different shades of blond—angel hair with a divine fragrance. It is a vetiver of extraordinary subtlety, reinterpreted by diptyque’s perfumer for the Vetyverio Eau de Parfum. 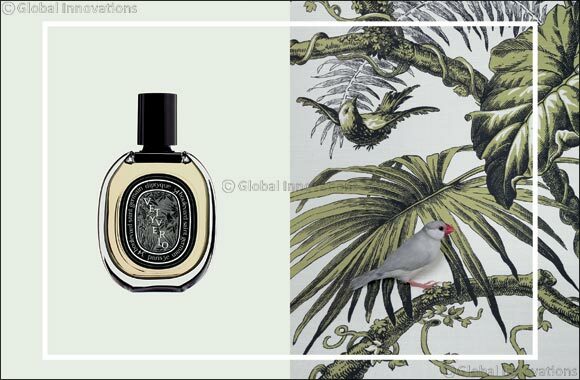 Like other diptyque fragrances such as Eau Duelle with Madagascar vanilla, Oud Palao with Laotian oud and Eau Moh�li with ylang-ylang from the Comoros Islands, Vetyverio shines the spotlight on a single raw material, keeping it pure and clear. It is immediately identifiable yet experienced in a unique way that is both familiar and new. diptyque has paid a dual homage to vetiver: first, with an Eau de Toilette in 2010 and now with an Eau de Parfum. Two distinct perspectives from the same perfumer, Olivier Pescheux. In the Eau de Toilette, two essences, one from Java and the other from Haiti, complement each other in a subtle balancing act. In the Eau de Parfum, used in a very high concentration, Haitian vetiver takes center stage. It reveals all of its dimensions: intense and enveloping with an extraordinary delicateness.